The holidays are here and along with all of the joy comes a lot of temptation. Wherever you turn there is candy, cookies, and a to-do list that seems to override every intention to exercise. Of course, if you’re a follower of my blog, you know that I have plenty of tools to help you squeeze in exercise and create healthy recipes for the holidays. And today I’m going to give you a few more!! Thanks to my friends at NuNaturals, I have created some wonderful holiday treats for you to try using some of their new products such as stevia chocolate syrup, stevia mint chocolate syrup, and the awesome flavored stevia drops. These products helped me come up with several new SUGAR FREE and DELICIOUS desserts!!! 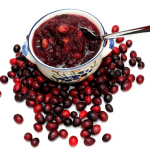 My SUGAR FREE CRANBERRY SAUCE is a great alternative to this holiday dish–you get all the vitamins and minerals of the cranberries WITHOUT the added sugar! Or try the SUGAR FREE CHOCOLATE CHIPS in any of my dessert recipes and for a great protein shake to start the day off, try my new SKINNY PEPPERMINT MOCHA PROTEIN FRAPPUCCINO…it tastes just like the Starbucks version but cheaper and with lots of protein. 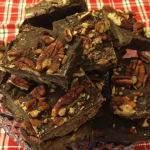 And if you’re on the go a lot during the holidays, toss one of my HOMEMADE PROTEIN BARS into your purse: a perfect snack of protein, carbs, and fat, and they taste just like chocolate brownies!! ( 1 ) one bottle of the Cherry Vanilla Stevia Liquid, a 50 pkt box of our NuStevia White Stevia Powder packets, a bottle of our NEW COCOA SYRUP, & a bottle of our NEW MINT COCOA SYRUP, PLUS A FREE BONUS PRODUCT! In addition, ALL of my readers can go to nunaturals.com and use the DISCOUNT CODE: BLG1214 to receive a 15% DISCOUNT on your ENTIRE ORDER, EFFECTIVE UNTIL DECEMBER 31, 2014. Hope you enjoy these desserts and have a wonderful holiday season!! !